The Episcopal Church’s most important liturgical season is the one that starts on Shrove Tuesday and ends on Easter Sunday. The weeks that lead up to Easter are filled with liturgical music, altar flowers (or lack thereof), vestments and altar cloths that reflect the passion, suffering, mystery and, ultimately, the ecstasy of the Christ and His resurrection. The coordination of all these is sacred to the parish and congregation. Coming to services and seeing how all these coordinate to reveal, impress and convey Christ’s passion is paramount to our personal connection with our Lord and the Easter resurrection meaning. Along with the sacred music of the season, altar flowers provide a visual impression of the music, the church service, and a reminder of His suffering and the eventual glory of His ascension and the Glory of God. All of this should be sensed subtly by the congregation as it participates in worship. If used at all, flowers on the altar should be subdued in color from the beginning of Lent through Palm Sunday and Good Friday. Absolutely no vibrant colors. Use different shades of white, beige or pale yellows. Think about coordinating the colors of the flowers with the color scheme in the altar cloths. Simplicity is the order of the day during Lent. There should be nothing dramatic in the design of the floral arrangements. No shooting stems, twigs or flowers from the center of the arrangements. Arrange flowers in the Trinity style. The design should be noticeable from the pews. There must be lots of greens to provide the design, and only simple flowers, if any, are called for. Do not overfill the vases with flowers as this will hide the symbolism of the design of the cross and the Trinity. On Palm Sunday, use no flowers at all. Fill the vases at the chapels and main altar with different types of palm leaves and ferns. Consider surrounding the altar and baptismal font with potted Kentia palms. Or place the palms at the rear of the church to immediately remind congregants as they enter the church of Christ’s entry into Jerusalem. Use no flowers at all. Fill all vases with twigs to form an upright design and use minimal greens at the very bottom of each vase. Use greens that are available or found in the garden, such as ferns or pittosporum leaves. Then think about putting a grape vine wreath at the center of each vase (use wreaths that are appropriate to the size of the vase and the arrangement). This reminds us of Christ’s passion and his Crown of Thorns. With permission from your vicar, rector or dean, you may want to add three purple tulips or other flowers at the center of the wreath. At Easter, Asian potted white lilies are called for both at the altar and throughout the surrounding altar area. No one flower is identified more with Easter than this lily. You can also use potted hydrangeas (blues, pinks, whites), cut hydrangeas, tulips, daffodils and other spring-time potted flowering plants and balance these around the lower altar areas — near and around the foot of the lecterns, entryways and baptismal font — to provide a visual sense of joy and renewal. Think about including blooming spring-time cut branches — cherry, apple, flowering myrtle, flowering almond and especially quince. Use these cut branches in the altar arrangements. Fill the lip of the vases with greens, including lemon or orange leaf stems. Don’t forget the cross design. We use phormium leaves to help with the cross design as they make a very strong strap-like statement running horizontally (remember size matters). 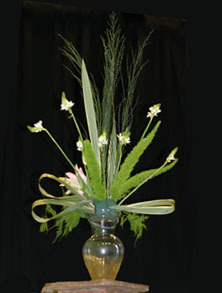 Long-stemmed flowers can also be used. Here we have used purple liatris, tuberoses, and always a white or pink Easter lily at the base of the arrangement at the center lip. We use asparagus fern leaves for the upright portion of the cross and this acts as a color counterpoint (spring green) and for the design. Keep it simple. Embodying the symbols of the cross adds to the overall celebration of the service, the Easter communion, its music and its liturgy. Both Keith and I wish you all a wonderful and blessed Lenten season and a renewal in the Easter rebirth of our souls. Let your hands create the mystery and glory of this season.